The idea to build the Forum in 1923 is credited to Sir Edward Wentworth Beatty, president of the Canadian Pacific Railway. 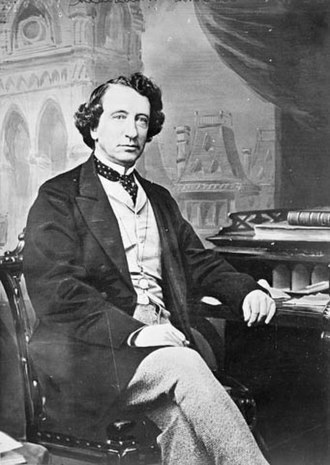 At the suggestion of Senator Donat Raymond, William Northey developed a plan for a 12,500 seat capacity rink. Plans were scaled back for financial reasons to a rink of 9,300 seats. Even at the reduced size, the rink could not immediately find financing. 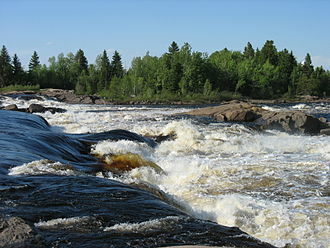 The Forum would eventually be financed by H. L. Timmins. The site selected was the site of a roller skating rink named the Forum, and the name was kept. The site had previously been the site of an outdoor ice hockey rink, used by Frank and Lester Patrick, Art Ross and Russell Bowie as youths. The Forum opened on November 29, 1924, at a total cost of C$1,500,000 ($21.7 million in 2017 dollars) with an original seating capacity of 9,300. It underwent two renovations, in 1949 and 1968. 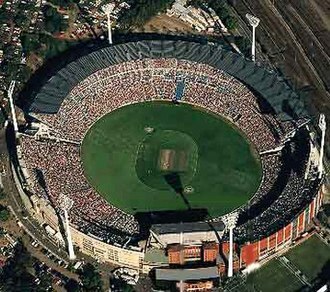 When the Forum closed in 1996 it had a capacity of 17,959, which included approximately 1,600 in standing room. "it was arguably the country's most famous sporting venue... it also serves as an icon for the role of hockey in Canada's national culture... the Forum is the oldest of Canada's large-scale arenas and has, throughout its history, been the country's leading site for major indoor cultural, political and religious events." The city of Montreal estimates the value of the building at $36.8M, in 2012. This is a $10M drop in value since the previous estimation in 2009. AMC Forum is now owned by New York City-based real estate investor Ben Ashkenazy through a firm called Investissements Forum Canadien Inc.
^ a b Canadian inflation numbers based on Statistics Canada. "Consumer Price Index, historical summary". Statistics Canada. Retrieved April 26, 2018. CANSIM, table (for fee) 326-0021 and Catalogue nos. 62-001-X, 62-010-X and 62-557-X. And "Consumer Price Index, by province (monthly) (Canada)". Statistics Canada. Retrieved April 26, 2018. ^ "The end of an era. (the Montreal Forum)". High Beam Research. 1996. Retrieved 2007-01-21. Rainforest Cafe is a themed restaurant chain owned by Landrys, Inc. of Houston. It was founded by entrepreneur Steven Schussler, the first location opened in the Mall of America in Bloomington, Minnesota, on February 3,1994. By 1997, the chain consisted of six restaurants, all in the United States, in 1998, it was planned to build 12 additional restaurants in the United States, seven in Mexico, and five in the UK, for a total of 22 restaurants by 2008. In 2000, the Rainforest Cafe was bought by Landrys Restaurants Inc. a company specializing in dining, entertainment, to date, the company owns restaurants in the United States, France, the United Kingdom, the U. A. E. Rainforest Cafe focuses on tourism for a majority of their income. Most locations have themed exteriors as well as interiors, the Rainforest Cafe in Disney Springs, located under a large artificial volcano which erupts during the simulated thunderstorms. Others, such as the locations in Atlantic City, Mall locations usually have waterfalls and simulated plant growth outside of them, visible to those who pass in the mall. Nearly all locations have a pond, usually with a moving crocodile figure. The restaurants are partitioned into rooms by means of rain curtains that fall into basins running along the tops of partition walls and booths. Most locations have two connected, but at the Walt Disney World locations, three tanks are connected. One portion of most locations includes a bar located underneath an enormous mushroom, the chain is known for its characteristic bar stools, made to resemble the legs of animals and sculpted by the artist Glenn Carter. There is usually a ceiling in the middle of the restaurant. Rainforest themed merchandise is sold in the shop, mostly printed by the Atlanta-based fashion apparel company. Toys including stuffed toys and action figures of the restaurant mascots are sold as well, Rainforest Cafe has a set of mascots, called The Wild Bunch. Cha. the red eye tree frog, the iguana, the crocodile, Rio, a macaw, the leopard, the elephant, the gorilla, the orangutan. These eight characters may be represented on childrens menus, merchandise, to enhance the theme, some of the animals are animatronic, manufactured by Russells Creative, LLC of Apopka, formerly UCFab International. The Montreal Junior Canadiens were a junior ice hockey team in the Quebec Junior Hockey League from 1933 to 1961, and the Ontario Hockey Association from 1961 to 1972. They played out of the Montreal Forum in Montreal, the Junior Canadiens were a farm team to the NHL Montreal Canadiens from the early 1930s until the institution of the NHL Entry Draft. The Juniors originally played in the Quebec Junior Hockey League, in 1961 the franchise switched to the Ontario Hockey Association to compete at the major junior level. It was granted entry as a club in 1961. 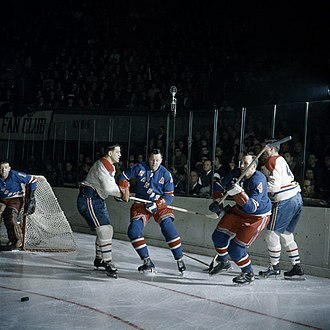 At the time, major hockey in Quebec, and the Quebec Major Junior Hockey League, in the Quebec Junior playoffs, the Junior Canadiens defeated the Quebec Citadels and the Halifax St. Marys. The series versus Halifax was surrendered by St. Marys when Montreal won the first two games on the road by scores of 11–3 and 10–1, after that the Junior Canadiens defeated the Guelph Biltmore Mad Hatters to represent eastern Canada in the Memorial Cup. The Memorial Cup of 1950 saw two teams of the Montreal Canadiens playing each other for the top junior prize. The Junior Canadiens defeated the Regina Pats in a game series by 4 games to 1. In 1955, the Quebec Junior Hockey League disbanded, with the Canadiens as the sole-survivor of the league, they elected to play an independent schedule but still compete in the Laurier Cup seasonal tournament with the teams of the OHA. The Canadiens would win the Laurier Cup that year, outplaying the best of the OHA, the Canadiens entered the Richardson Trophy playdowns as an independent team, but lost in the finals to the OHAs Toronto Marlboros 4-games-to-3 with 1 tie. In 1956, their parent team moved them to the Capital Region under the name Ottawa-Hull Canadiens, the Jr. Habs would play a series of games against the OHA, the Quebec Hockey League, and the OHA Senior A League to prepare for the playoffs. The Canadiens finished second in the Laurier Cup to the Toronto Marlboros, the Canadiens would have a great season, win the George Richardson Memorial Trophy as Eastern Canadian Junior A champions, but lose the 1957 Memorial Cup in seven games to the Flin Flon Bombers. Francis Alexis Frank Patrick was an early Canadian professional ice hockey player, NHL head coach and manager. Raised in Montreal, Patrick moved to British Columbia with his family in 1917 to establish a lumber company, the family sold the company in 1910 and used the proceeds to establish the Pacific Coast Hockey Association, the first major professional hockey league in the West. Patrick, who served as president of the league, would take control of the Vancouver Millionaires, serving as a player, coach. It was in the PCHA that Patrick would introduce many innovations to hockey that remain today, including numbers, the blue line. His Millionaires won the Stanley Cup in 1915, the first team west of Manitoba to do so, in 1926 the league, which had since been renamed the Western Canada Hockey League and Western Hockey League due to mergers, was sold to the eastern-based National Hockey League. Patrick would join the NHL in 1933, serving first in a role for the league. 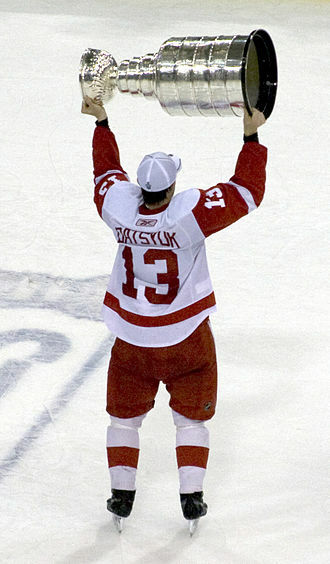 His brother Lester Patrick was an ice hockey player, coach. Patrick was the son of a wealthy lumberman Joseph Patrick, who invented the idea of putting numbers on players uniforms, while attending McGill University, Patrick played hockey from 1904 to 1908, winning the Queens Cup championship in 1905 alongside his brother Lester Patrick. In 1907 Patrick moved with the rest of his family to Nelson, British Columbia, Patrick would spend the next several winters there, except for 1909–10 when he and his brother Lester joined the Renfrew Creamery Kings of the newly formed National Hockey Association. Well-regarded nationally as one of the top defenders in hockey, Patrick was paid $2,000 for the season and he scored 8 goals in 11 games for Renfrew, though the team failed to win the championship despite having some of the biggest names in the sport. Frank and Lester helped found the Pacific Coast Hockey Association and he played for the Vancouver Millionaires of that league from 1911–1918, winning a Stanley Cup in 1915. He served as PCHA president until 1924, in addition, he was the owner of the Vancouver Amazons womens hockey team. The Bell Centre, formerly known as the Molson Centre, is a sports and entertainment complex in Montreal, Canada. It opened on March 16,1996, after three years under construction. It is best known as the home of the National Hockey Leagues Montreal Canadiens ice hockey team and it is currently owned by a partnership group headed by Geoff Molson and his brothers and Justin. The same ownership group owns the Montreal Canadiens and Evenko, since it opened in 1996, it has consistently been listed as one of the worlds busiest arenas, usually receiving the highest attendance of any arena in Canada. In 2012, it was the fifth-busiest arena in the based on ticket sales for non-sporting events. Construction began on the site on June 22,1993, almost two weeks after the Canadiens defeated the Los Angeles Kings at the Forum for their 24th and most recent Stanley Cup. The name of the arena initially reflected Molson, Inc. a brewing company which was owner of the Canadiens at the time. Molson elected not to keep the rights when they sold the team. The renovations, which are not expected to interfere with operations, have a budget of $100 million. Bell Centre is located in downtown Montreal, near the corner of Avenue des Canadiens-de-Montréal, the Lucien LAllier station, to which it is connected, is next door on that corner. In addition it is located across the street from the 1250 René-Lévesque skyscraper and it is easily accessible by public transportation, as it is linked to both Lucien-LAllier and Bonaventure Metro stations. It is connected to the city and Central Station. The building covers an area of 1.568 hectares or 3.87 acres and it has a seating capacity of 21,288, making it the largest hockey arena in the world. It holds four restaurants, the most popular being La Cage aux Sports, madame Diane Bibeau plays the organ on Saturday nights. A new scoreboard was installed prior of the 2008-2009 season, the new scoreboard consists of four 510 square foot video panels. It was the biggest in the NHL until 2012 when Tampa Bay installed their new scoreboard and it is one of only two NHL arenas that uses an old-style siren to mark the end of periods instead of a horn, the other is TD Garden in Boston. The Chicago Blackhawks are a professional ice hockey team based in Chicago, Illinois. They are members of the Central Division of the Western Conference of the National Hockey League and they have won six Stanley Cup championships since their founding in 1926. The Blackhawks are one of the Original Six NHL teams along with the Detroit Red Wings, Montreal Canadiens, Toronto Maple Leafs, Boston Bruins, since 1994, the clubs home rink is the United Center. The club had played for 65 years at Chicago Stadium. The clubs original owner was Frederic McLaughlin, who owned the club until his death in 1944, under McLaughlin, a hands-on owner who fired many coaches during his ownership, the club won two Stanley Cup titles. The club was owned by the Norris family, who as owners of the Chicago Stadium were the clubs landlord. At first, the Norris ownership was as part of a syndicate fronted by long-time executive Bill Tobin, after the senior James E. Norris died in 1952, the Norris assets were spread among family members and James D.
Norris became owner. Norris Jr. took an active interest in the team and under his ownership, after James D. Norris died in 1966, the Wirtz family became owners of the franchise. In 2007, the club came under the control of Rocky Wirtz, who is credited with turning around the organization, under Rocky Wirtz, the Blackhawks won the Stanley Cup three times within six seasons. On May 1,1926, the NHL awarded a franchise for Chicago to a syndicate headed by former football star Huntington Hardwick of Boston. However, only one later, Hardwicks group sold out to Chicago coffee tycoon Frederic McLaughlin. McLaughlin had been a commander with the 333rd Machine Gun Battalion of the 86th Infantry Division during World War I and this Division was nicknamed the Blackhawk Division after a Native American of the Sauk nation, Black Hawk, who was a prominent figure in the history of Illinois. McLaughlin named the new team in honor of the military unit. The Black Hawks began play in the 1926–27 season, along with new expansion franchises Detroit Cougars, McLaughlin took a very active role in running the team despite having no background in the sport. Saint Catherine Street is the primary commercial artery of Downtown Montreal, Canada. The street runs parallel to the largest segments of Montreals underground city, the series of interconnected office tower basements and shopping complexes that make up this main thoroughfare lie immediately north of the street. Educational institutions located on or near the street include Concordia University, McGill University, Université du Québec à Montréal, Dawson College, Saint Catherine Street has been home to many of Montreals prominent department stores, including such former retailers as Eatons, Morgans and Dupuis Freres. Today, the Morgans building is home to Hudsons Bay Company, the Simpsons building is now shared by the La Maison Simons department store and a multiplex cinema, while Eatons was converted to the Complexe Les Ailes. Dupuis Frères, located further east at Saint Catherine and Saint Hubert, is now a shopping mall, the Ogilvys department store remains a fixture on Saint Catherine Street, although it is now a collection of boutiques rather than a single store. 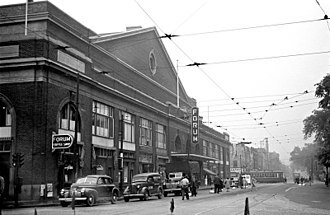 The Montreal Forum, once home to the Montreal Canadiens, is located on Saint Catherine Street at Atwater Street. It has since turned into a shopping and movie theatre complex called the Pepsi Forum. 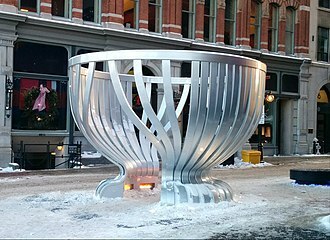 Due to the Forums presence on this street, Saint Catherine was used as the parade route whenever the Canadiens won the Stanley Cup. This was once referred to as the route by Mayor Jean Drapeau, during the Canadiens dynasties of the mid-century. The segment in the district of Hochelaga-Maisonneuve is an important commercial area in that neighbourhood, for one weekend in July every year, Saint Catherine Street hosts Canadas largest open-air sidewalk sale. 2 km of the street between Jeanne-Mance Street and St. Mark is closed to traffic, and vendors from nearby shopping centres bring out their sale merchandise, there is live entertainment along the street. It is estimated that over 300,000 people visit the downtown during this event, bus service is provided by the STMs 15 Sainte-Catherine and 34 Sainte-Catherine which both operate 7 days a week. The Montreal Canadiens are a professional ice hockey team based in Montreal, Quebec. They are members of the Atlantic Division of the Eastern Conference of the National Hockey League, the clubs official name is le Club de hockey Canadien. The team is referred to in English and French as the Habs. French nicknames for the team include Les Canadiens, Le Bleu-Blanc-Rouge, La Sainte-Flanelle, Le Tricolore, Les Glorieux, Les Habitants, Le CH and Le Grand Club. Founded in 1909, the Canadiens are the longest continuously operating professional ice hockey team worldwide, the franchise is one of the Original Six teams, a description used for the teams that made up the NHL from 1942 until the 1967 expansion. The teams championship season in 1992–93 was the last time a Canadian team won the Stanley Cup, the Canadiens have won the Stanley Cup more times than any other franchise. They have won 24 Stanley Cups,22 of them since 1927, on a percentage basis, as of 2014, the franchise has won 25. Since 1996, the Canadiens have played their games at Centre Bell. The team previously played at the Montreal Forum which housed the team for seven decades and all, the Canadiens were founded by J. Ambrose OBrien on December 4,1909, as a charter member of the National Hockey Association, the forerunner to the National Hockey League. It was to be the team of the community in Montreal, composed of francophone players. The teams first season was not a success, as they placed last, after the first year, ownership was transferred to George Kennedy of Montreal and the teams fortunes improved over the next seasons. 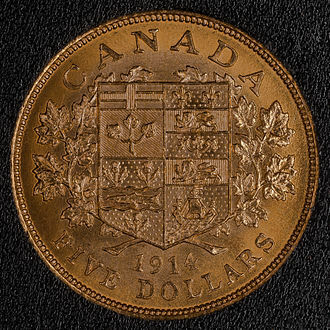 The team won its first Stanley Cup championship in the 1915–16 season, in 1917, with four other NHA teams, the Canadiens formed the NHL, and they won their first NHL Stanley Cup during the 1923–24 season, led by Howie Morenz. The team moved from the Mount Royal Arena to the Montreal Forum for the 1926–27 season, the club began the 1930s decade successfully, with Stanley Cup wins in 1930 and 1931. 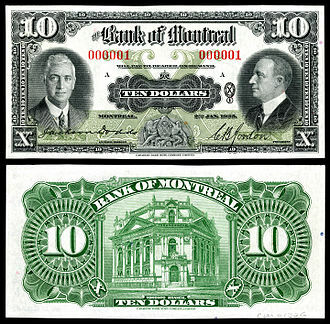 The Canadiens and its rival, the Montreal Maroons, declined both on the ice and economically during the Great Depression. 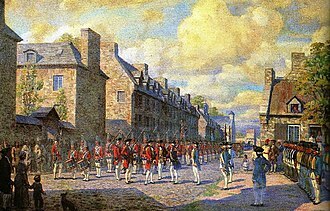 A general view of Sainte-Catherine. The Kenora Thistles posing for a photo with the Stanley Cup in 1907. Ross is in the front row, far right. The Ottawa Senators during the 1914–15 NHA season. 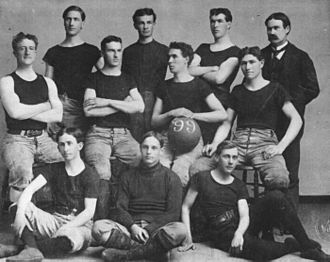 Ross is in the back row, fourth from left. The Art Ross Trophy. Ross donated the trophy in 1947 to be awarded to the leading scorer in the NHL regular season. The Canadiens' locker room prior to being renovated. 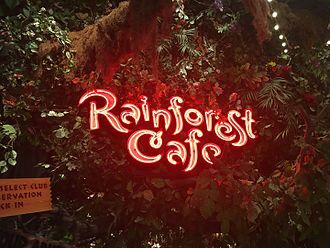 A neon-sign welcomes visitors to a Rainforest Cafe, located inside the Great Lakes Crossing Outlets shopping complex in Auburn Hills, Michigan. The logo of the Rainforest Cafe at Disney's Animal Kingdom. The interior of the Rainforest Cafe in Dubai Mall, Dubai. A sign outside of Rainforest Café at Disney's Animal Kingdom. Delorimier Stadium, seen here in 1950, was the home of the Montreal Royals. Statue at Montreal's Olympic Stadium of the Royals' most famous player, Jackie Robinson made by sculptor Jules Lasalle. Royals and Jackie Robinson memorial at former location of Delorimier Stadium. A quarter century later, Great Hockey (Большой Хоккей) videos of Soviet-Canada games remain popular with Russian sports fans. In this photo, they are advertised among top hits at a DVD shop in Nizhny Novgorod.